One of the highlights of Apple’s iOS 6 launch today is Passbook, the company’s new tool for managing your loyalty cards, coupons, boarding passes, movie tickets and similar cards that you may currently be carrying around in your wallet. For businesses, this is a great opportunity to bring their loyalty programs and coupons into the twenty-first century, but how to get started with Passbook isn’t self-explanatory. That’s where Tello’s PassTools comes in. 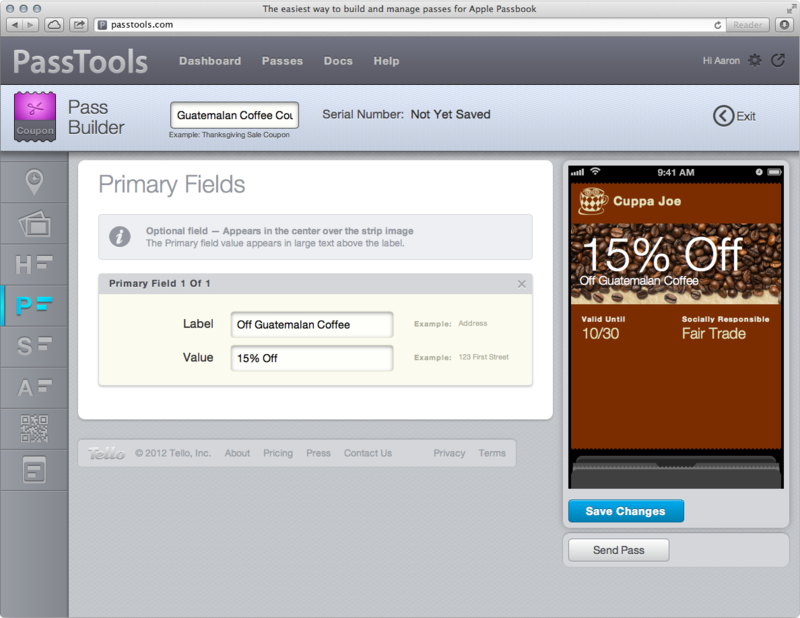 The service, which is launching today, will allow businesses to create and manage their passes for Apple’s Passbook. Tello, by the way, was a TechCrunch Disrupt SF 2010 Battlefield contestant. As Tello CEO and founder Joe Beninato told me yesterday, the company worked closely with Apple during the iOS 6 beta phase. Apple, said Beninato in our interview, “created an amazing consumer service experience for its users” and his company aims to do the same for business owners. Instead of having to deal with .pkpass files and having to build their own JSON files to make use of Apple’s Passbook API, businesses can just use Tello’s PassTools to create their passes by just filling out a few simple forms. Users who have iOS 6 installed on their devices can also use the service to just build a sample pass and send it to themselves to test the Passbook app (which is likely empty at this point). 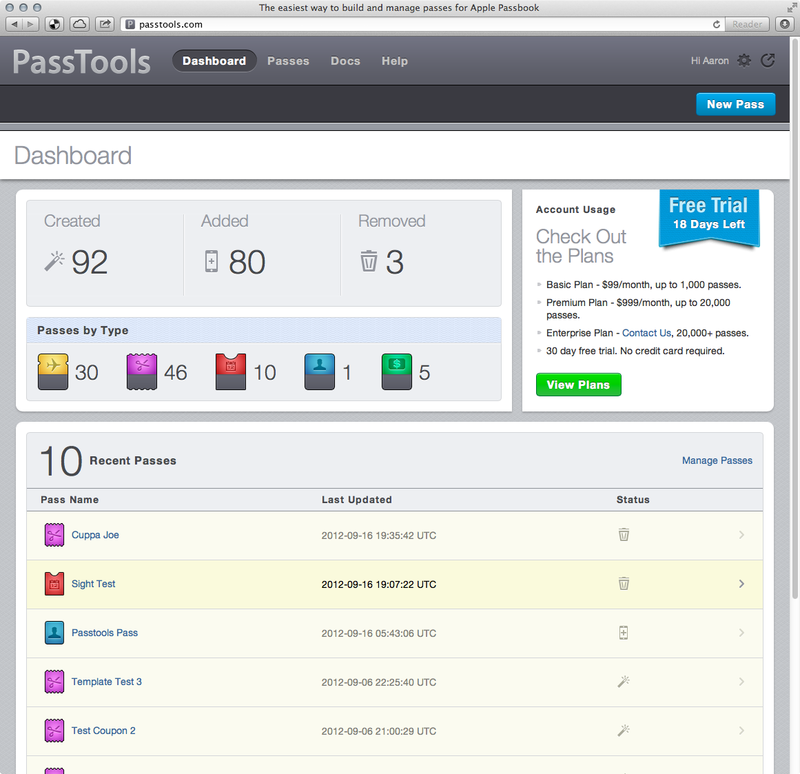 Once it’s in its final state, the service will consist of four major tools: a pass builder for designing passes (these are delivered by email), a template builder for businesses that want to create a high volume of personalized passes, as well as a dashboard for analytics and an API for managing passes. For the time being, however, Tello is only launching the pass builder. The other tools will launch in the coming weeks. With the pass builder tool, small businesses will be able to easily create their own passes and manage them without the need to know the ins and outs of the Passbook API. Once the rest of the PassTools service is live, the company will obviously also go after larger clients who will be able to make use of the company’s API and the template builder for managing a large number of customers. Pricing starts at $99 per month for up to 1,000 passes or API calls. The company also offers a free 30-day trial.